Why become a Certified Health Informatics Systems Professional - CHISP®? Investing in a Certified Health Informatics Systems Professional - CHISP® credential is investing in yourself and your long-term career. Whether you’re just starting out or are experienced in health IT, a CHISP certification identifies you as a leader in the industry and is your pathway to career advancement, a higher salary, and more opportunity in your chosen field. As healthcare continues to evolve, new technologies and regulations create openings in academic institutions, consulting agencies, government agencies, and healthcare software companies as well as within healthcare practices. 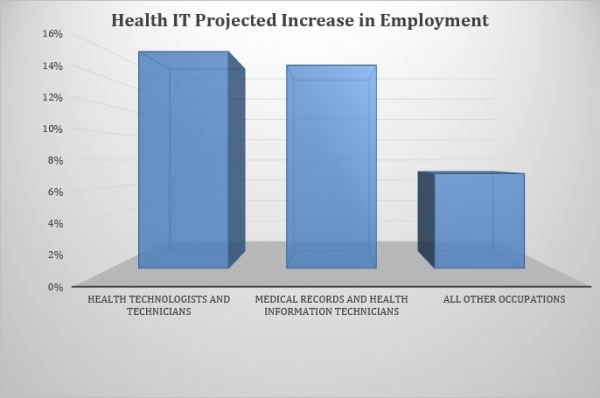 There are approximately 12,000 to 50,000 new jobs anticipated by 2017 by the Bureau of Labor Statistics, who also cite HIT and medical records as one of the 20 fastest growing career fields in the nation. And those positions promise competitive salaries: HIT starting salaries range from $20,000 to $30,000 for entry-level positions with an associate’s degree while those with bachelor’s degree report salaries ranging from $30,000 to $50,000. Within five years, the range is $50,000 to $70,000. From an employer’s perspective, CHISP certification indicates you are dedicated to professional development and have a solid HIT foundation. Our credentials serve as a demonstrable qualifier of professional expertise. Employers also trust that as a certified CHISP you’ve mastered the critical thinking and practical application skills our program requires.